This past week leaves began to fall, pumpkin beers started to hit shelves, and Ian Clark was seen wearing sweat pants. Autumn is here, and that means it’s hockey season! A quick recap from last year: In June, the Western Conference champion Los Angeles Kings nearly swept the Eastern Conference representatives, the New York Rangers, to capture their second Stanley Cup in three seasons. The Western Conference continued to assert its dominance over the East, and the Toronto Maple Leafs fell just short of a playoff spot. So much can change in a summer. Just… none of those things. The Kings are still one of the league’s best franchises, while the Rangers have a shot at topping out the East. As for the Toronto Maple Leafs… well, I’ll let our friend Dan Grant have a crack at that tomorrow. I’ll just say since I have this forum and you (presumably) are reading it, that I have very low hopes for the Leafs this year. We have come up with seven essential questions that I will address with all of my expertise, one by one. By the end of this you can consider yourself a professional hockey savant. Let’s hit it! (1) Who changed jerseys this summer? Lots of guys. Heh, this is easy. 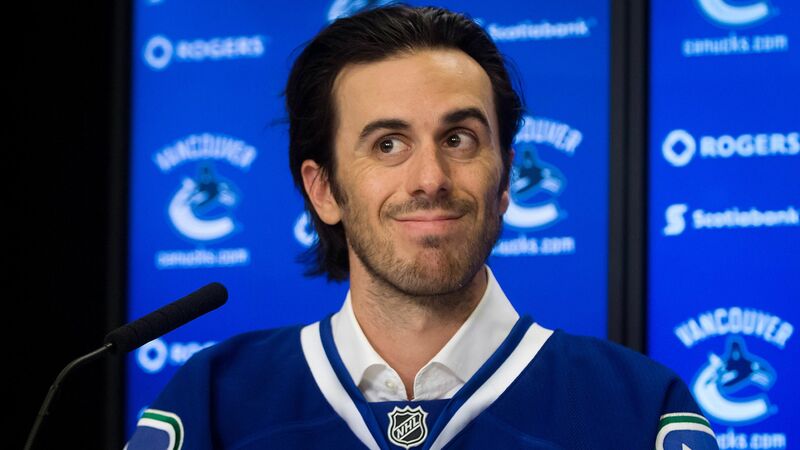 Ryan Miller, pleased to be in Vancouver. (1) Which important players changed jerseys this summer? Fine. In goal, the most significant jump occurred in the Western Conference, where Ryan Miller moved to the Pacific Northwest and joined the Vancouver Canucks. Miller’s jump clears up, once and for all, a very messy goalie situation that had been in play in Van City since Roberto Luongo and Corey Schneider both earned starters’ minutes back in 2012-13. Schneider was since traded to New Jersey last summer, while Luongo was sent to the Florida Panthers back in March. Miller should make the Canucks a better defensive team, and that could be enough to cover a significant loss. That loss is talented two-way centre Ryan Kesler, who was sent down south to Anaheim in a late-June trade. That move gives the Ducks two dangerous centres (Ryan Getzlaf being the other) and should boost their chances of dethroning their California counterparts. One last Western conference move is centre Paul Stastny moving from the Colorado Avalanche to St. Louis. Stastny is a talented centre who can score and create goals, and helps give the Blues much-needed scoring. (2) Did the defending champions do anything important? Well, if it ain’t broke. The Kings are a powerhouse, and made sure to keep their chances of repeating as high as possible by signing forward Marian Gaborik to a long-term deal. Gaborik joined the Kings at the trade deadline last season, and went on to score 16 points in 19 regular-season games and 14 goals in 26 playoff games. (3) Does the Eastern Conference even exist in your mind? Of course it does. Kind of. Slovakian goalie Jaroslav Halak joined the New York Islanders, who must feel that they are a decent goalie away from making a long run in the playoffs. That’s not far off the truth, and Halak has made a career of keeping mediocre teams respectful. The Islanders had a respectable offense last season, but gave up more goals than every team except Florida and Edmonton. Halak’s presence should help boost that pathetic record. The Pittsburgh Penguins, in search of an answer to their frustrating post-season disappointments, shook up the East by sending 40-goal scorer James Neal to Nashville for depth forwards Patric Hornqvist and Nick Spaling. This could help, and Nashville should reasonably predict 25-30 goals from Neal, at best. Subban and the Canadiens look ready. (4) Tell me about Canadian teams. (4) WHAT ABOUT CANADIAN TEAMS?!?!? Ugh… not much to report. We already covered the Canucks (gained Miller, lost Kesler, just below playoff position). Moving across the prairies, the Edmonton Oilers added veterans Mark Fayne and Benoit Pouliot, and are still hoping that their young guns Taylor Hall, Ryan Nugent-Hopkins, Nail Yakupov, and Jordan Eberle can grow into more than just flashy attackers. They should take a step forward this year. Unfortunately, a step forward for them won’t amount to much more than 10th or 11th in the conference. Also of note: analysts have been predicting the Oilers to take a step forward for about three seasons now. The Winnipeg Jets are still lacking a true number one centre, and were unable to address that issue this offseason. Evander Kane is their only true offensive weapon, and Ondrej Pavelec still has a lot to prove in goal. They will continue to plumb the depths of the Western Conference. Speaking of the plumbing the depths, we move East to the Ottawa Senators. The Sens lost their long-time face-of-the-franchise, centre Jason Spezza, to the Dallas Stars. They will struggle to do much of anything this season, and our friends along the Rideau Canal will have a long winter. Lastly, the Montreal Canadiens were the only Canadian team to make the playoffs last season, and managed to earn 100 points in the process. They are a team full of young, fast forwards, with a solid corps of defenders and an all-star goalie in Carey Price. Barring injury, I would expect the Canadiens to repeat as playoff contenders. The TL;DR version is that Montreal will be very good, Toronto and Vancouver might be half-decent, Edmonton, Calgary, Winnipeg and Ottawa will be very bad. In fact, the poor performance of Canadian teams in recent years is a growing problem that may need addressing from the league office. (5) Any wacky rule changes to watch out for… again? Why, yes, of course. What is a summer in the NHL without rule changes? In the department of paint and markings, the goaltender area behind the net, otherwise known as “the trapezoid”, is now larger, which allows goalies more room to play the puck. Also, the hash marks in face-off zones around the ice have been spread further apart. This will keep opposing players further apart, in the hopes of opening up play from face-offs. Tripping has been expanded to include those great defensive plays where a defender dives to the ice and knocks down an attacker, even if he contacts the puck first. I hate this, and would prefer a soccer-style approach, where contact with the ball first means no foul has been committed. Video replay use will be increased, in an attempt to create more “good hockey goals”, and the league office will be looking for more definitive evidence of a kicking motion before cancelling goals. In short, there will be some very suspicious goals coming up this season. Lastly, the league is taking a harsher stance with divers, and will be going after repeat offenders, and teams, with increasing fines. How it plans on telling the difference, I’m not exactly sure, but getting rid of diving is a good thing overall. (6) Care to make some award predictions? Sure. Keep in mind these are all based on players having healthy seasons, and never forget that I predicted Bryce Harper to win a National League MVP two years ago, so take these with a few grains of salt. Hart Trophy: Sidney Crosby, Pittsburgh Penguins. I know, a real head-scratcher to start with. Vezina Trophy: Brian Elliott, St. Louis Blues. Elliott has long been a standout, but has hardly had the opportunity to showcase himself for a whole season. This will be his season, behind a stout Blues defense. Calder Trophy: Samson Reinhart, Buffalo Sabres. Reinhart is coming off a season in which he scored 105 points in just 60 games for the Kootenay Ice of the Western Hockey League. He is joining an awful Buffalo team that has no reason to let him stay in the minors and will get all the ice time he needs to make a mark at the NHL level. 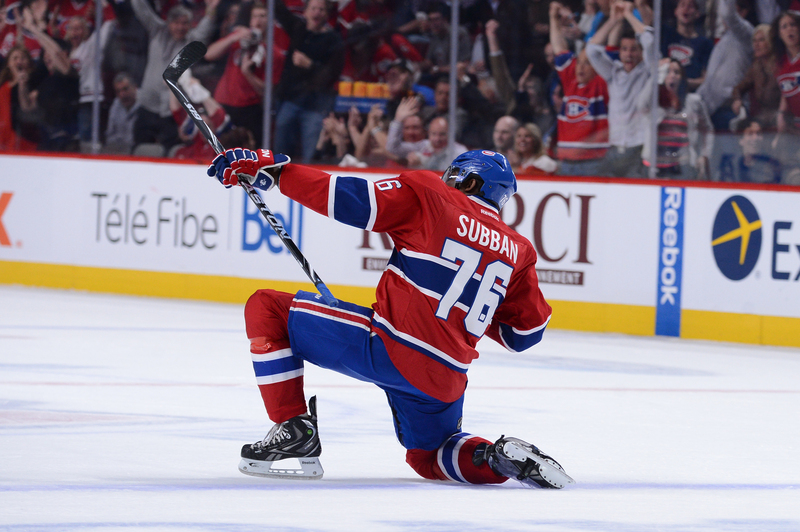 Norris Trophy: PK Subban, Montreal Canadiens. The Rexdale native has made a home in Montreal, and with a fat, new contract tucked into his wallet, will have a clear mind and plenty of motivation to reach for 60 points. He will need to move the needle towards the positive on his plus/minus, however, to earn this award for a second time. 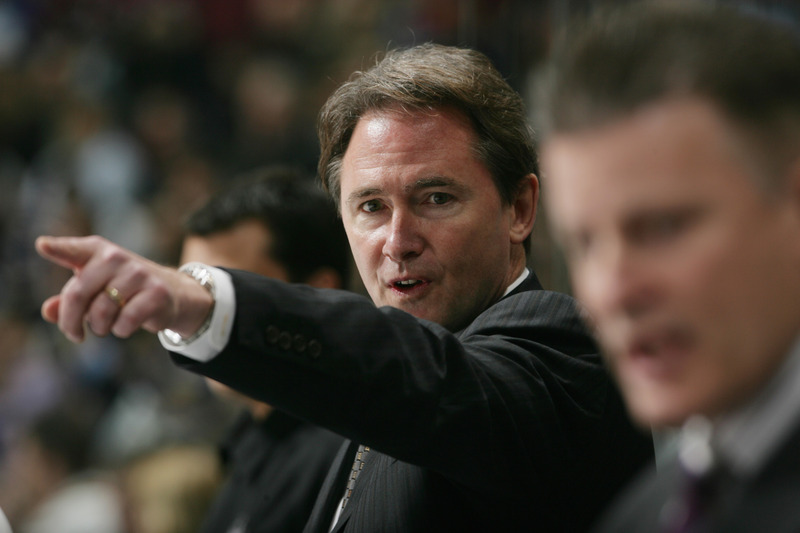 Can Penguins Head Coach Mike Johnston point the team in the right direction? (7) What teams should we expect to come out of the Eastern and Western Conferences in June? I’ll start by saying that it’s very hard to repeat trips to the Finals, so I am eliminating the Kings and Rangers based solely on that logic. They are both very impressive teams, no doubt, but will they have the legs to slog through another 82-game season, plus 20-something playoff games? Possible, but unlikely. In the West, the Ducks are turning to two inexperienced goalies in John Gibson and Fredrik Andersen, and that is a tough transition. I’m looking at the Colorado Avalanche to be best in the West, with St. Louis close behind. Out East, the Pittsburgh Penguins have a puncher’s chance, with all of their talent, but new coach Mike Johnston has no NHL experience. That’s enough to make me second-guess them. The East’s best team, as it was last year, will be the Boston Bruins, who have retained their star players and continue to be a model of consistency. The NHL still has too many teams, and too few that turn a profit. The disparity between the rich and the poor, and lately, between the American and Canadian, are getting harder to ignore. Their moves to add offense show a desperation not necessary in the other big North American leagues. While it may add marginal viewers, it will not change a problematic economic model that needs addressing.